Healing Parkinson’s Disease Naturally – Recovery Inspiration #57 … A soothing moment! This morning I sat down at the lake watching the waves roll gently past the dock on their journey shoreward. There is nothing as therapeutic for me as listening to waves softly lapping the shore and this was pure bliss! Watching and listening, I felt completely at peace, awash in tranquility! My body was free from tension and trembling and I was grateful! It was a soothing moment and I felt awesome! PS … were they waves or millions of particles rolling in unison? Albert!?! I just finished reading The Last Stonecaster, by first time Toronto novelist Howard J Breen. It is an awesome book! Breen has truly hit a home run with this effort! Harmony and bliss in two simple words … heh heh! This post is mainly for the fellas out there and I urge you to read on! Ladies, I’m sure you’re well aware of the principle I’m about to explain, but if you’d like to check it out, I would be honored! Thanks to the suggestion of a blog reader, I have recently taken an interest in the teachings of Pema Chodron, a fully ordained Tibetan Buddhist nun. 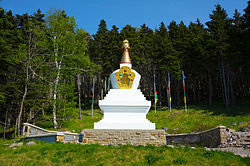 Chodron, who makes her home at Gampo Abbey, a monastery in Cape Breton, Nova Scotia, Canada, advocates spending time in silence. She says that at one point she spent a year in silence.